Someone is knocking at the door to Grace Adams's house and won't stop. Grace thinks she knows who it is, but when she looks out her bedroom window, she sees a woman she doesn't recognize walking on the trails behind her home. The woman isn't alone for long before a man emerges from the dark of the surrounding woods and stabs her, then retreats into the shadows, leaving her to die in the snow. Frantic, Grace calls the police but knows they'll never arrive in time, so she herself goes to the woman and is shocked to find she's not a stranger--and that only raises more questions. Karin Salvalaggio's debut is an assured crime tale set in the northern reaches of small-town Montana, near the Canadian border, and kickstarts a series featuring Detective Macy Greeley. Which is just as well, because when I got to the end of BONE DUST WHITE, having devoured it in less than a day, I certainly wanted to read much more about the understated, intriguing Montana detective. Greeley is the kind of character you quickly fall alongside, that has a 'series protagonist' vibe about her. Greeley is heavily pregnant, dealing with plenty of complications in her own private life, when she's sent to Collier after a woman is murdered, stabbed to death in the snow. The woman's daughter Grace, who hadn't seen her mother since she vanished amidst all sorts of scandal 11 years before, is the only witness - and Greeley needs to tease any information she can out of the teenager. But how does this new homicide tie into an old case involving four dead girls - a case Greeley is particularly interested in? Collier is a small-town, and connections are everywhere. As are secrets. Salvalaggio does a great job drawing us into Greeley's investigation, and the world of small-town Montana. She creates a nice sense of place, even if the place isn't all that nice (in parts). Beautiful natural landscapes are pockmarked by decrepit fishing shops, meth labs, and trailers left to rot behind truckstop diners. The townsfolk know each other well, while keeping secrets from the police and each other. There's something festering beneath the surface, even among many of the politer citizens. Greeley knows almost everyone she talks to is holding something back. But about what? Beyond the pregnant sleuth, the other characters in BONE DUST WHITE are also well-drawn and interesting, such as Greeley's ex-lover Jared who is the paramedic who finds the near-frozen Grace but has all sorts of problems going on in his own life. It's a town full of connections, a spiderweb of relationships and past histories. All sorts of personal agendas clash and stumble over each other. Salvalaggio delivers a gritty and textured first novel that shows plenty of storytelling talent. There's an authenticity to her character and the issues that bubble through the storyline - even if they could make some readers queasy at times. She has a lovely touch for evoking the Montana setting. 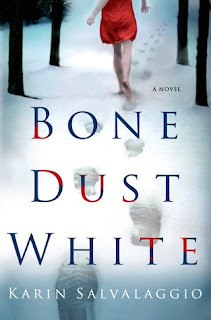 Overall, BONE DUST WHITE was a book that I thoroughly enjoyed reading; I was fully drawn into the world Salvalaggio had created, enjoyed riding along with the characters, and as soon as I closed the covers I wanted to go and grab another Macy Greeley tale off the shelf.